Green Lanterns #54 Review – AiPT! Green Lanterns #54 improves on #53, but still fails to truly engage the reader. It’s been a rocky road for Green Lanterns ever since the series turned into the flagship Lantern book for DC Comics. What started out as a mysterious, suspenseful arc quickly devolved into a dull, mostly forgettable story. Picking up almost immediately where issue #53 left off, Green Lanterns #54 continues the “Evil’s Might” story, although it’s an issue that more reveals the machinations of the previous rather than progress the plot any further. 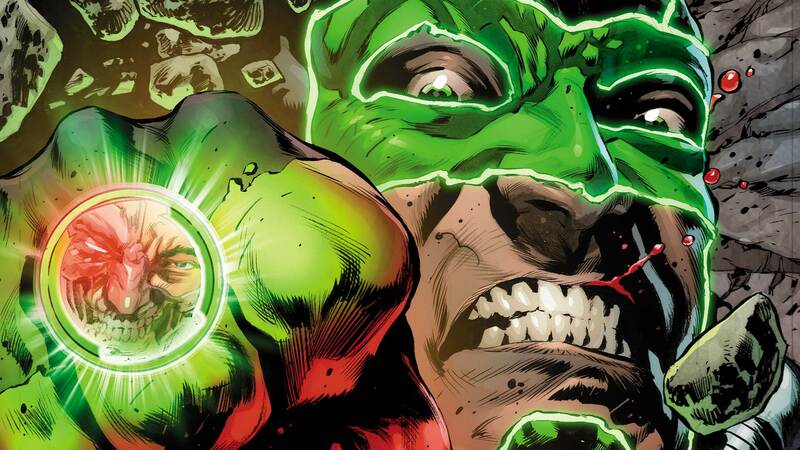 What results is an issue that satisfactorily pulls back the curtain on some of the mystery of the previous issues, all the while turning Simon Baz into something he’s not- a foolish, untested, and ineffective Lantern. Wherever Green Lanterns #54 fails, at least it is an improvement on dialogue and artistic presentation- for the most part. With the exception of one glaring example where the villain exclaims his name for no reason, the dialogue feels less corny and generic than in previous issues. By no means is the dialogue suddenly riveting or poetic, but it definitely feels more natural and conversational than before. The art has improved as well; I didn’t find any examples of character’s facial expressions or body language contradicting what was on the panel, as had been experienced in previous issues. Much like the improved dialogue, the art isn’t abruptly phenomenal, but it is undoubtedly a step up from the last few releases. There is one scene in particular, however, that felt like poor execution on all fronts- the restoration of the Penelo people. It’s clear this was supposed to be an uplifting scene showcasing the humanitarian side of the Lanterns as they relocate what’s left of the displaced Peneloians (Penelo-ites? Peneloans? Who knows? ), but the overall presentation just makes it feel insincere and forced. The Lanterns aren’t gently placing these evolved creatures into new homes, they’re dumping them into the ocean like they’re Utah’s department of Wildlife restocking a lake, making these displaced refugees feel dehumanized and fishlike. There’s also a moment where one of the refugees thanks Jessica Cruz for what the Lanterns did that day… What they did?! They let your planet get destroyed along with 97% of your population!! The whole sequence just felt insincere and weird. The bulk of the issue focuses on Simon Baz’s exploits back on Earth, as he is unknowingly being tricked into service by Cyborg Superman. As a longtime reader of the series, I found the treatment of Simon Baz here to be nothing more than irritating and unfaithful to the character. Simon Baz has never been foolish, gullible, or so nearsighted, so why is he suddenly so easily tricked by Cyborg Superman? It’s not like Baz has anything to prove to Superman- they’ve worked together on numerous occasions, even as recently as the fantastic “Ghosts of the Past” arc. So why is Baz yearning for Superman’s approval all of a sudden? On top of that, Cyborg Superman isn’t even that clever and Baz knows it! Yet, he still manages to fall for the rouse, even acknowledging how weird and off everything felt to him. This makes Baz seem like a bumbling fool who stupidly falls into an obvious trap. It’s completely out of character and really makes the whole story feel illogical. At least the confrontation with Cyborg Superman brings answers to some of the arc’s biggest mysteries… sort of. It’s legitimately satisfying to learn how Cyborg Superman pulled so many strings while locked in the Fortress of Solitude, eventually coming to completely control the Lantern’s rings. Luckily Cyborg Superman didn’t reveal everything, like why the weather on Mogo is so insane or who the hell Eon is, so there’s still plenty more revelations to come as the series progresses. Cyborg Superman shows that since taking over the power battery he’s been able to spread distrust and deceit among the Lanterns, which caused them to utterly fail in their defense of Penelo. This is a subtle yet strong allusion to the spread of misinformation on social media and I really like how Jurgens injected this little message into the book without being obnoxious about it. Jurgens uses this moment to forewarn that distrust and belief in false information can cause failure in even the strongest of groups, and I think that’s something worth thinking about. Overall, Green Lanterns #54 falls in line with the rest of the series- it’s entirely forgettable. The issue isn’t really bad, save for the representation of Simon Baz, but at the same time it doesn’t have any glowing moments of triumph either. It’s simply an average issue in the midst of a totally average story arc. Green Lanterns has better dialogue and presentation than previous issues alongside some interesting reveals, but it’s ultimately a forgettable issue with not much going for that also makes a fool out of one of its best characters- for no good reason. Baz is represented as a bumbling fool who succumbs to an obvious trap in an issue where he seems completely out of character throughout. Marvel Comics reveals Superior Spider-Man returns this December!